No matter if it contains an exotic chef’s kitchen, luxurious master suite, or comfortable living room, every home is first judged on its curb appeal. New siding, a new front porch, or even an updated front door can breathe new life into a ho-hum exterior. And, during the warmer months when friends and family come calling, an updated backyard entertaining area can make your home the place to be for creating lasting outdoor memories. One of the first things you can do involves just a little bit of elbow grease. Weeding flowerbeds, cutting back shrubs and some well-placed pruning of trees can go a long way to refreshing the front yard. If you want to go a step further, painting the front door, adding new bark or mulch, or adding some defined edging make for an easy weekend transformation. Looking for curb appeal? Think big with your exterior home remodeling project. If you’re really looking to make an impression, though, it’s time to start thinking bigger. Adding a front patio, or even enlarging an existing front patio can bring a drastic change. Painting the exterior walls and trim a vibrant color or changing out tired siding can fully update your curb appeal. Even if it can’t be seen from the front, backyard changes can also give your home new life. In addition to cleaning up the landscape, a porch or patio can bring those gatherings outdoors with plenty of room for everyone. 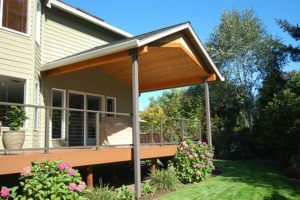 Depending on how much room you have, adding a pergola with handcrafted details can provide interest as well as shade during the warmer months. If your backyard can handle it, though, a wraparound porch expands your entertaining area by providing that much more seating areas or room for a grill for outdoor cooking. And with so many options for railings, this addition can be made to match your existing home or even give it a more modern look. Designers Northwest, Inc., has been transforming home exteriors in the Vancouver, WA, for 30 years. No matter the style of home, Designers Northwest, Inc., has the experience to make these changes while keeping in step with the original architectural. Older homes with intricate detailing are not a problem as we have highly skilled and trained carpenters to replicate any architectural design. Contact us today to set up an appointment or take our introductory questionnaire and let us know what you want to do.